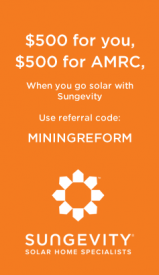 Please make a charitable contribution to the Arizona Mining Reform Coalition. Last year was a good year for us, but there is much more to do in 2014. We need your financial support. Please make a donation to the Arizona Mining Reform Coalition so we can continue our work to protect Oak Flat, the Santa Rita Mountains, and Arizona’s many lands and waters threatened by inappropriate mining projects. We have successfully stopped the Oak Flat land exchange again this year. We helped stop the Rosemont mine for another year. we traveled to London to begin working to collaborate with people around the world impacted by Rio Tinto. 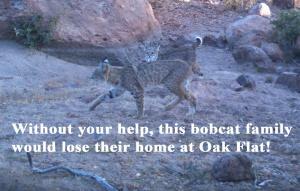 Our Camera Project at Oak Flat has been active for 2 years. We have documented many rare species as well as recreational uses at Oak Flat. We meet on a regular basis with state and federal regulatory agencies to share our views and learn what they are planning. Our successes are exciting and encouraging. However, we need your help to expand on our success next year. We are a lean and frugal operation and pledge to use your contribution wisely! Provide a presence and a voice on the national stage to keep positive reform of federal mining laws and rules alive and fend off attempts to further weaken mining laws. We can’t emphasize enough the importance of your support! If you prefer to mail a check or would like to know more, please contact our Director. Any amount will help, but please be as generous as you can – and dig deep! The deeper you dig into your pocket, the less digging will happen on Arizona’s precious public lands. Your contribution is tax deductible to the extent allowed by law for federal non-profit organizations. P.S. As the only non-profit organization working exclusively on mining issues in Arizona, our work is of critical importance. Not only do we help protect our communities and the environment from inappropriate mining, but our member groups depend on our leadership and assistance to make their efforts more valuable.